If you have been paying attention to the news lately, there has been one very interesting report published by the NRDC (Natural Resources Defense Council) about the biggest energy hogs in the home. What's so special about it? 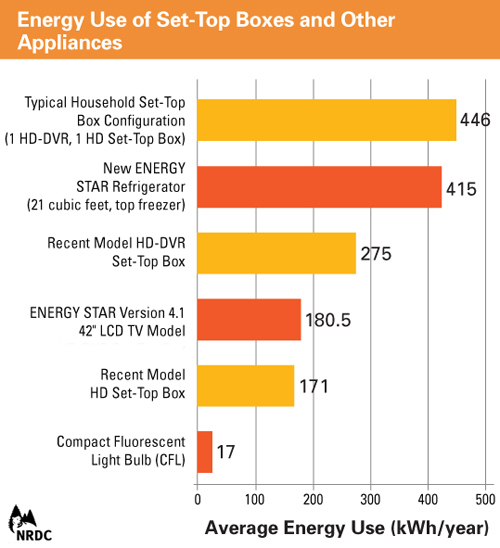 The fact that a recent model HD DVR/PVR -- otherwise known as a digital video recorder or personal video recorder -- are among the biggest energy hogs in the American home. Sounds exaggerated or not entirely believable? Being an avid user of HD PVRs in my home, when I looked at the graph published by NRDC, even I was a bit surprised. But whatever your question may be, we have just the right equipment here at APH Networks to test whether or not this is the case. To conduct this experiment, I used a Motorola DCT3416 HD PVR used by my local cable company, and plugged it into the wall through a Seasonic PowerAngel meter. Here is what we have found. In other words, NRDC is pretty much right on. So meanwhile we are trying to save a watt here and there, it becomes an undeniable problem that our PVRs are sucking down the power at hugely inefficient levels. I mean, at the very least, put that hard drive in standby mode once in a while -- we don't need it running 24/7. You can save at least 5W right there. And for the rest of the system? It's not like it is hard to make anything efficient. With the price cable companies want to charge us for these boxes, it is hard to argue even from an economic point of view. My entire Lenovo ThinkPad T420 with an Intel Core i5-2520M processor, 8GB of RAM, Western Digital Scorpio Blue 500GB hard drive, NVIDIA Quadro NVS 4200M 1GB graphics, 14" LCD screen at max brightness, and an active Intel Centrino Ultimate-N 6300 WiFi card does not even use more than 12W in idle conditions. And I can assure you, my laptop is heck a lot more powerful than the Motorola PVR in my living room. It is about time we called them out on sloppy engineering and poor design practices. APH Networks purchased all equipment used in this article to facilitate this report.